When will the talks from my retreat be available online? Can you send me the password for a retreat I participated in? How do I find a retreat to participate in? What does "freely offered" mean? Can I offer Dharma Seed talks on a website or to a meditation group? How do I search for a talk? Can you add me to your email list? Can I order a CD of a talk? What are some other good resources for Dharma talks and instructions online? How do I change/suspend/cancel my recurring donation through PayPal? I am able to stream a talk successfully, but then it quits some number of minutes into listening to the talk. Help? How can I save a talk from Dharma Seed on my Apple iOS device (iPhone, iPad) for offline playback? Is there a Dharma Seed app? How does a teacher join and upload talks to Dharma Seed? Talks are usually uploaded by the group that organized the retreat (or sometimes the center that hosted). Contact the retreat organizers directly, and they should be able to tell you. Contact the center that hosted the retreat, or the retreat organizers directly, and they should be able to help you out. Dharma Seed hosts and freely offers the talks given at retreats, but we don't have a part in the organizing or running of retreats. You'll want to contact a center near you to inquire about events. The five main organizations we serve would be a good place to start - if none of these have something to offer due to distance or scheduling, I'd recommend contacting the one closest to you and they may be able to offer additional ideas. Insight Meditation Society has a good page of links to resources that may be helpful as you get started. All audio files on this website are covered by a Creative Commons "Some Rights Reserved” license. You can’t repackage talks to sell to others (as opposed to giving them away), nor can you use only portions of the talks in another project or product. You must always credit the person or organization who owns this Creative Commons copyright, which in our case is usually the teacher offering the talk. If you give a copy of the talks to others, you must inform them the talks are protected by copyright in this way. If you're interested in sharing or using these talks, please read the details of the Creative Commons Attribution-NonCommercial-NoDerivitives licence we use, and email us if you have any questions. Offering the talks in this way is an act of trust and generosity by those making them available, and we ask that you keep in mind that treating these talks as precious Dharma teachings is itself a valuable practice of the teachings. Yes, as long as you credit the author of the talk (the teacher), offer the talk in unabridged and unmodified form, and do not request money in exchange for offering it, you are free to play and distribute the talk to others. Please read the details of the Creative Commons Attribution-NonCommercial-NoDerivitives licence we use, and email us if you have any questions. From the talks page, simply type in words separated by spaces and click the "Search Titles and Descriptions" button. If all of those search words are found in the title or the description of a talk, the talk will be listed. For more advanced options, please read through our full Search Instructions. If there is particular information you'd like to be kept up to date on by Dharma Seed, do let us know. We've been thinking about setting up a "proper" email list, and it would be great to know what folks would be interested in hearing about periodically. Unfortunately, we don't have any transcripts of the talks at this time. It's something we'd like to offer, but aren't there yet. If you do go through the process of transcribing any of the material and wanted to offer it for the benefit of others, please do send us a copy - we can upload it to appear alongside the talk for future listeners. Dharma Seed developed this website because for most people, downloading or streaming a talk is the easiest way to hear it. It is also the most efficient way for us to make talks available to you. For some, however, a CD may be the only way to hear the talks. In that case, if you know someone who has the technical skills to make you a CD from a downloaded talk, you are welcome to ask them to do that for you. Dharma Seed used to have a friendly arrangement with a small organization that charged a fee to cover their costs and to receive some modest compensation for this service, but as of October 1st, 2016, this is no longer be available. This site is an archive of Dharma talks given by Gil Fronsdal, Andrea Fella and various guest speakers at the Insight Meditation Center in Redwood City, CA. Birken Forest Monastery ('Sitavana') is a Canadian Theravada Buddhist monastery following the Thai forest tradition of Ajahn Chah. They host an extensive collection of talks in their tradition. This forest sangha site functions as a portal page for the Branch Monasteries and Associated Monasteries of disciples of Venerable Ajahn Chah, particularly in the West. Then click "Manage pre-approved payments"
That will list everything that is being done automatically with your account, and allow you to make changes as needed. Often this is caused by a half-downloaded version of the file in your browser's cache. The way to clear this cache differs depending upon the browser you're using. In Internet Explorer 8 choose: Tools->Internet Options->General (tab)->Browsing history (section)->Delete... (button). On "Delete Browsing History" dialog check ONLY "Temporary Internet Files" (uncheck all others) and click "Delete" at the bottom of the window. In Firefox choose: Tools->Options->Privacy (tab)->Private Data (section)->Check "Ask me before clearing private data"->Clear Now ...->Check ONLY "Cache", uncheck all the rest->Click "Clear Private Data Now" (button). This will clear your 'Browser Cache', at which point you can try to stream the file again. These instructions will download the talk as a podcast, after which you will be able to access it through the iOS Podcast app. The Podcast app also allows you to remove it from your device. You can also control it at any time by launching the Podcast app directly. We have an app for iPhones, iPads, iEtc, which you can find in iTunes. 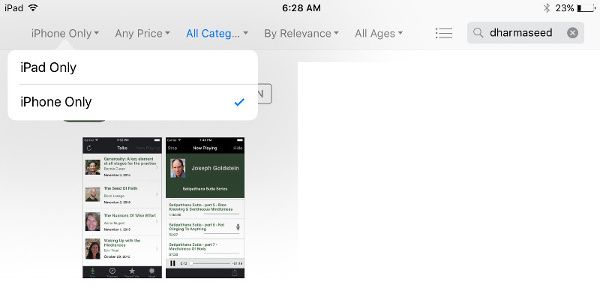 Note: The Dharma Seed App currently shows up for "iPhone Only". If you are installing it on an iPad or iPad-mini from within the App Store, search for dharmaseed and then look for the drop-down menu in the upper left to change the filter to "iPhone Only", and it should show up for installation. completed a full Teacher Training Program at the Insight Meditation Society, Spirit Rock, Gaia House and/or Meditationszentrum Beatenberg. We will host the talks given by these teachers, independent of where they were given, and will list all talks by these teachers on the main Dharma Seed website. In addition to hosting the talks, we can create a "venue view" for centers founded by those teachers. This gives a webpage that shows just the talks given at that location, or under the auspices of that organization. Talks given at that location by teachers that don't meet the above criteria can also be shown here, even though they would not be displayed on the main Dharma Seed site. For example, Spirit Rock has a "venue view" at sr.dharmaseed.org. All talks given at Spirit Rock (that have been marked "for public" by the teacher) are available here, including talks by teachers that do not show up on the main dharmaseed.org site. If there is a teacher who fits this criteria who would like to offer their talks on Dharma Seed, we'd be delighted to be of service. They can contact us directly and we'll get them set up.